DMP AI processor IP, ZIA™ DV700, is the ultra low power consumption processor IP for Deep Learning on edge side specialized on inference processing. ZIA™ DV700 enables inference processing on multiple data types such as images, movies and sounds. In the AI / Deep Learning system consisting of a large-scale cloud system and an enormous number of edge side IoT devices, distributed processing is expected to spread widely. 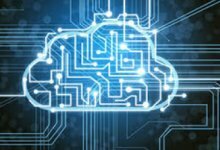 While learning processing will be done on cloud side due to the required tremendous amount of data, it is expected that the inference processing will be carried out solely on edge size, meeting the mandatory requirements of real-time, safety, privacy and security. In case of inference processing in edge side, low power, high performance and low cost are must have features to be a competitive AI processor. ZIA™ DV700 is configurable processor IP that use DMP’s advanced processor and hardware optimization technologies. ZIA™ DV700 allows optimization of both performances and hardware size for dedicated inference processing. Since ZIA™ DV700 offers to realize inference processing meeting optimal for each edge application, including low power consumption and small size, DMP will strongly promote the use of your AI / Deep Learning. High Performance, Low Power Consumption, Small Foot Print IP for Deep Learning inference processing. Configurable IP Core (Adjustable number of Convolution Layer）. Support major Neural Network like CNN、RNN、LSTM and GoogLeNet. 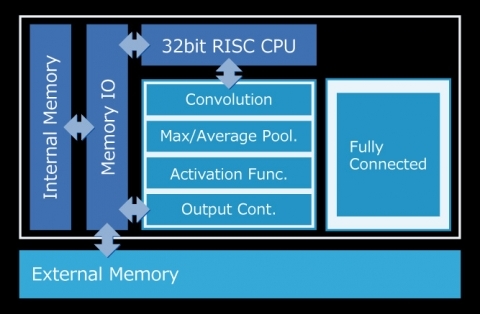 Powered by 32bit RISC processor (To control Neural Network）. Support Caffe and Tensor flow protocol buffer.